I know you'll love Mom's easy donut recipe. The good news is, these donuts really are easy to make! One of my fondest childhood memories was helping Mom to cut them out and then watch her fry them in the hot lard. You'll be proud to serve such a crispy, tasty treat to your loved ones, especially one that you made yourself. 1 Egg, 1 cup milk, 1-1/3 cups sugar, 2 teaspoonfuls cream of tartar, 1 teaspoonful baking soda, piece of butter the size of a walnut, 1/4 teaspoonful cinnamon (or nutmeg), pinch of salt, and flour enough to roll soft. Method: Beat the egg and sugar together and add the milk and butter. Stir the soda and cream of tartar into the flour, dry; mix all together, with the flour and salt. Roll and cut into doughnut rings, and fry in deep fat. Lay them on brown paper to cool when you take them from the fat. Eat them plain or sprinkle with granulated sugar if desired. Enjoy eating them while they are warm and fresh. 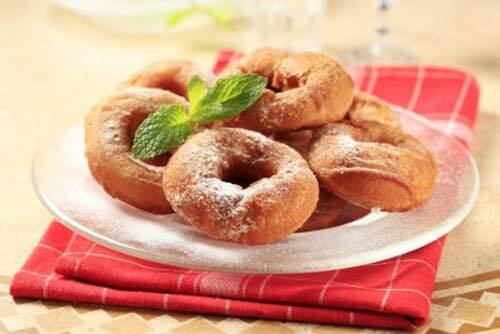 As a bonus, this old fashioned potato donut recipe is one of my late mother-in-law's recipes. It's said that the Fleming family purchased this prize-winning recipe at an estate auction sometime in the 1930s, but it's thought to be much older. It has become a Bell family tradition to make these potato donuts each year at Christmas time, and they always get rave reviews. Why not make them a holiday tradition in your family too? You must simply try making these yourself. People won't believe it when you say they are made from potatoes. They're sooooo yummy! My wife Vicki uses about 3 liters (or 3 quarts) of oil to fry her donuts in. She finds that canola oil works just fine, but her mother always insisted that using pure lard gives them a nostalgic taste. 2 cups mashed potatoes; mix butter size of egg with potatoes; add pinch of salt, 3 cups white sugar, 3 beaten eggs, 1 cup milk. Sift 7 cups all-purpose flour. Put 5 cups flour with eggs and milk mixture. Take remaining 2 cups flour and add 4 teaspoons baking powder. Add bit of nutmeg. Mix. Fry in deep fat on a medium stove until golden brown. On a cold winter's evening, Mom would sometimes select Grandma's easy donut recipe from her recipe box, heat some lard on the old kitchen stove, and deep fry a big batch of donuts. She used a ring-shaped cookie cutter to cut the donut rings, but sometimes she would cut the dough into other cookie shapes for me as well. Almost any simple shape can be used for donuts as long as it's small enough to enable proper frying overall. If the shape is too large, the centers will end up being doughy. That's why donuts have holes! It was so much fun watching the little rings of dough bob about in the hot oil while they were frying, and the warm, crispy donuts tasted so good when done. Now, you can enjoy making them in your kitchen for your family. Enriched wheat flour, water, hydrogenated soybean and cottonseed oils, sugar, yeast, dextrose, calcium sulphate, salt, yellow corn flour, monoglycerides, guar gum, calcium propionate, wheat gluten, sodium stearoyl lactylate, sodium acid pyrophosphate, sodium bicarbonate, citric acid, ammonium sulphate, turmeric and annatto, ascorbic acid, azodicarbonamide, sulphites. Contains: wheat, soy, milk, eggs, and sulphites. Wow! That list should set off a few warning bells! Flour, milk, eggs, sugar, butter, sodium bicarbonate (baking soda), cream of tartar, natural spices and a pinch of salt. What a difference! It's so easy to see why the homemade variety are not only better tasting but much better for us too. No wonder homemade tastes so delicious!